Will there be roadblocks when we begin naturally sharing our faith with nonbelievers? Of course! I can tell you this: if you love people and spend time listening for the leading of the Holy Spirit, you will find your way. As you seek the Lord’s leading in your relationships with lost people, here is one of the approaches you could try. The Thirty-Seconds Rule is a commitment to pause at specific times in the flow of a day to recalibrate our hearts and eyes toward the people around us. It’s a time to allow the Holy Spirit to tune us in to what he would have us do and who he would have us love. It’s a chance to say to God, “Here I am. I’m ready to scatter the seed of your gospel. Please use me as a conduit of your living water to help seed grow.” When we hit the pause button on our day, the whole direction of our lives can change. The Thirty-Seconds Rule is so simple anyone can do it. In the course of your day, just make time to stop for thirty seconds and ask these three simple questions. What would the Spirit of God prompt me to pray as I walk into this portion of my day? Who does God want me to notice right now? How might I extend the love of God and the grace of Jesus in this situation? Walking into your workplace or school. Entering the home of someone who is not yet a follower of Jesus. Engaging in a social setting that involves people who are far from God. Walking into a restaurant, store, or other business. Driving down the street where you live. •Entering any place you go on a daily basis. The Thirty-Seconds Rule is simply a decision to take your foot off the emotional gas pedal of your day and slow down enough to let the Holy Spirit sensitize your heart to what is happening around you. Every single day we have many opportunities to extend grace, share God’s love, and care for the people we encounter. But too often we race past these open doors. Practicing the Thirty-Seconds Rule creates open moments for God to speak and offer direction. At that point, I had made myself available to God. Now I would wait on the Spirit for an open door. The couple I was visiting were old friends of our family, and over the years they had grown more and more open to spiritual things. But they also could get very defensive and closed off if they felt like someone was trying to “push religion” on them. In a quiet moment the wife pulled me aside and shared that she was struggling with her husband’s lack of motivation in life. She wondered what I thought it would take to stir his heart and give him meaning and purpose. I immediately saw this moment as divinely orchestrated. I asked her, “Do you really want to know what I believe Ben needs to receive fresh direction in his life?” She assured me that she wanted to know my thoughts on the topic. I shared my testimony of how my life had lacked direction and focus until I became a follower of Jesus. I told her how my life had dramatically changed after I accepted Christ and asked him to forgive my sins and be the leader of my life. I told her that I believed the only way Ben would find power to set a new direction for his life was if he became a follower of Jesus. She said she would like that very much. So then and there I cried out to God for Nancy and Ben. Nancy sat beside me, praying with me to a God she didn’t yet know, asking God to help her husband. I am convinced that the open door for this powerful moment came during the thirty seconds I paused to ask God to open my eyes and use me. Will you take thirty seconds, just a few times each day, to recalibrate your heart? If you are willing, God is ready to move in fresh and powerful ways. My book Organic Outreach for Ordinary People, Updated and Expanded Edition includes many examples of ways we can scatter seed and let the living water of Jesus flow through us. We often don’t know if the soil of people’s hearts will be ready. And we must always remember that we can’t change anyone. 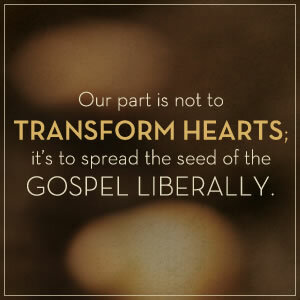 Our part is not to transform hearts; it’s to spread the seed of the gospel liberally. So get started today! Throw some seed out there, try something new, and see what God does. Get your copy today and see how it could help activate your whole church for authentic, gracious, effective evangelism.